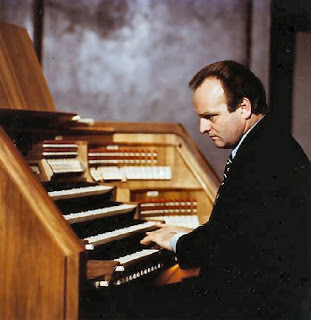 Karl Richter (1926 – 1981) was a German conductor, choirmaster, organist, and harpsichordist. He studied with Günther Ramin, Carl Straube and Rudolf Mauersberger. In 1949 he became organist at St. Thomas Church, Leipzig, where Johann Sebastian Bach was once Musical Director. In 1951 he moved to Munich, where he taught at the conservatory and was cantor and organist at St. Mark’s Church. This entry was posted in Organist and tagged Bavokerk, German, Haarlem, Johann Sebastian Bach, Karl Richter, Leipzig, St. Thomas. Bookmark the permalink.